Taylor Swift wearing a skeleton-key necklace. Locks and keys can also be used to protect one’s most valued belongings or to secure the gates of a walled city, so having a key is both a symbol of trust and conquest. Back in the day, keys were used as a means to flaunt your wealth, as they indicated you had something worth stealing. 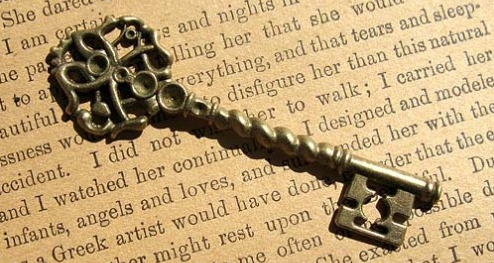 Metaphorically, a key can expand knowledge or offer passage to other, metaphysical realms. But, when I see a girl wearing a skeleton key necklace, like the one offered by Lauren Blythe Designs on Etsy.com (above) or the one worn by country-pop star Taylor Swift from BeMonogrammed.com (right), I sometimes wonder what it means to her. When a woman puts an antique key on a chain and wears it around her neck, close to her heart, it could mean any number of things, a mystery just begging to be unlocked. The precedent for jewelry as symbols goes back at least to Queen Victoria, who hardly ever wore jewelry that didn’t have a emotional message of love or mourning. On the other hand, it could just be fashion. Most skeleton keys are really bit or barrel keys, such as all but the flat one at bottom-center shown here. Being a history nerd, I have to quibble a bit with the skeleton key necklace trend. Let’s start with the name. Clearly you look at these rusty old antique keys and they have a Halloweeny quality to them, as they resemble slender arm and leg bones that could be rattling in a grave. The tops, or bows, of these keys often feature Gothic trefoils, the triple-circle motifs seen in medieval churches representing the Trinity, or quatrefoils, the four-leaf clovers representing the Four Gospels. These bow shapes were thought to give the key the protection of God. So, from this standpoint, the impulse to associate them with Goths and call them skeleton keys makes sense. The key to your heart? More often than not, though, necklaces made out of skeleton keys do not, in fact, use actual skeleton keys. 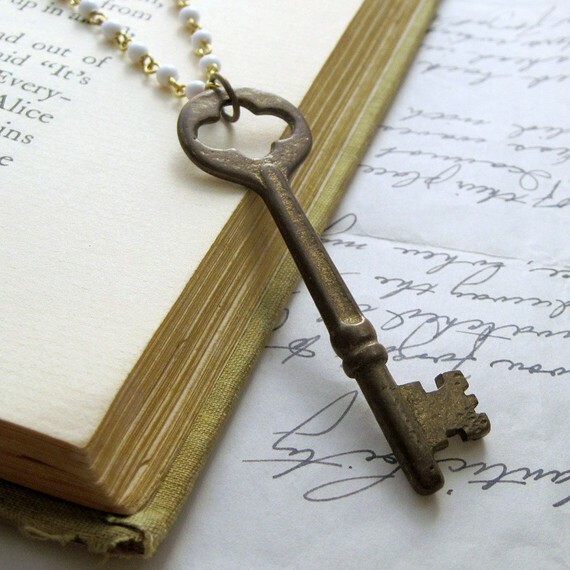 A skeleton key is a specific kind of antique key that opens many doors (there we go again with the metaphors!). But if you pick up an antique key and you’re not a knowledgeable key collector or trained locksmith, you probably can’t tell whether it’s a skeleton key or not. Odds are the key you are attracted to for its design is just a single-lock key rather than a skeleton master. This style of key, which was used for more than 1,500 years, is known as a “bit” or “barrel” key. The bits are the teeth at the end of the key that operate the lock. Such keys can be called barrel keys when their shank, the long, bone-like part of the key, is hollow, like a barrel of a gun. The other thing to know about antique bit and barrel keys is that their companion locks were tremendously easy to pick. I understand an antique key conveys mysteries that are ancient and universal, whereas your house or car key merely suggests something much more practical and mundane, but at least newer keys really work. 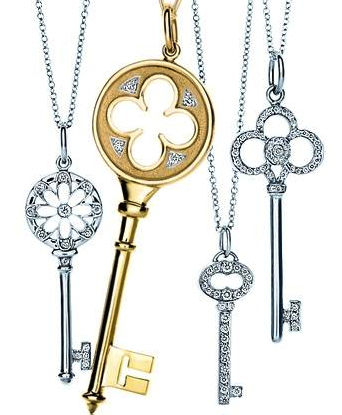 These fine-jewelry pendants from Tiffany’s obviously don’t have corresponding locks. The reason is that modern blade keys operate the pins and wards of a lock in two dimensions—not just one the way a bit key does—and so provide much more security. When I see a girl with wearing a bit key around her neck with a heart-shaped bow, it screams to me, “The lock on my heart is extremely simple to crack!” Which, to be fair, could be true. The good news is, unless you want a fancy sterling silver key encrusted in white diamonds and have no interest in owning an authentic piece of the past, antique keys are cheap. You can get one for around $1, put it on a chain, and voila! You have all the mysteries and treasures of your life embodied in a one-of-a-kind pendant. If you want your necklace to be as beautiful as it is unique, look for a bow in the French Rococo style, as locksmithing became an art for French metal workers, who made intricate, swirling, filigreed bows. Keys should never be put on a the table, as it leads to chaos and disagreement in the house. Keys in the bed can help a woman in the process of childbirth. Keys in the shape of crosses help cure boils. Church keys—usually weighty iron keys with a cross on the bit or bow—are particularly powerful, able to cure whooping cough and calm unruly children. This is an example of an elaborate French-style antique bit key. or being able to stop bleeding when bound to wounds and as protection from certain types of witchcraft and shamanistic attacks. There is quite a lot to this and the occult traditions are old and varied, coming from both expected sources and less so, things like cabalistic symbolism, voudou and even some christian traditions, keys, especially iron keys, have historically been about more than locks. Some of this is likely due to the simple fact that many of these old keys are made of iron and were/are common and pleasing to look at as well as able to be worn as amulets of one kind or another without arousing too much suspicion. Iron as a metal has been seen as both hallowed and unclean by various groups at different times. I must say I’m a huge fan of key necklaces. I use both accessories made of old keys and silver jewelry. I noticed they are gaining popularity these days. i found this very interesting. i as well love keys, and they can be very mysterious and fun. i remember my daughter bought me a key once and i macramed a necklace and put it on it. i wore that necklace all the time, i quess symbolizing i too have something special to keep safe……..her. My infant daughter passed away in March. In the same day, today, 6/19, i found an antique key And a feather in the exact same spot! Signs from heaven? Skeleton keys are (solid) on the bottoms which open multi-locks ..keyes with. -( holed) or hollowed, bottoms.. normally. .go to one- lock mechanisms. I’ve always wanted to establish the collective noun for keys: “A nightmare of keys”! Won’t you please join me in helping coin the collective noun for these evil little ‘necessities’? 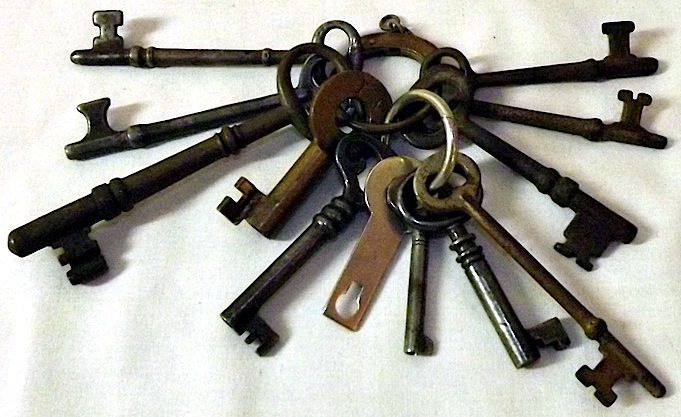 Ah, some say that is “a ring of keys” but – that is specific to keys connected by a ring, not really a collective noun. The collective noun SHOULD be: “A nightmare of keys”! Think about it. When they break. Bend. Fall through cracks (elevator doorways are sure fun for that!). When you can’t find them. When they should work, and don’t. When you have so many to try that it would be quicker to go to locksmith’s school and pick the damned lock. Here is one, in your ignition, when the wind has slammed your car door shut? And it is running. Or just when you lock them inside a room or car. Worst case scenarios, you say? Well, what is best case? They allow you to open a door, or box, diary, padlock… whathaveyou. What a circular best case. If the item had never been locked, the unlocking wouldn’t have been needed. The idea itself is enough to make a person sad. “I’d like this possession of mine to remain mine despite the existence of thieves.” Um, thieves have a buh-zillion ways to get through locked obstacles. So you are – perhaps – at best – helping honest people stay that way. Hate the bastards. Even the aesthetics of them have gone away. The skeleton keys and ones with ornate scroll-work – antique shops. Now they are angular, sharp, knifey things that when in your pockets (\pocketbooks) dig into your flesh and scratch your cellphone. They are admissions that humans are no damn good. We take stuff. We keep stuff and enslave things and sometimes animals and sometimes people. We claim things and insure them (just as bad as keys, frankly). Am i being hard on keys and soft on locks? Locks are almost always used for the same purpose (they can replace door hinges in a pinch, but that’s a quibble for another time!) – but they include combination locks, and i do not despise them – AS MUCH. Requires a memory, but i have found that when i use them often (many times a month, no months go by without using them) i suddenly have a great memory for the combinations. Why? They let me cope without a nightmare of keys in my pocket! Extremely interesting article! (And very well written, I must say.) Thank you for the history and knowledge!! Keys are made of metal or plastic. They have no magical properties nor do they endow anyone with magical abilities of any kind for simply wearing one around the neck. Keys are for opening and locking doors and other such things as boxes, coffers and treasure chests. Simple as that. It’s actually not as simple as that, even (especially) to a reasonable person. Using Reason’s logic, Reason’s comments are just dark spots on a complicated construction of plastic, metal, and glass, simple as that – of course, it’s not as simple as that: Reason’s comments are a collection of pixels on a monitor, symbolizing a collection of binary numbers, which in turn symbolize digital letters and words and punctuation, which in turn symbolize written letters and words and punctuation, which in turn symbolize spoken sounds, which in turn symbolize the thoughts and ideas transmitted through communication between reasoning human beings. In other words, human communication is built on a complicated, delicate, and fairly precise collection of symbols, in a variety of formats – the key as a symbol is just one of many forms of communication, and in this case one that transcends the barriers of written languages over vast distances of space, culture, and historical time: people who do not speak, read, or write the same languages can generally understand the way that keys are used in each others’ art work (depending on the context, a person depicted holding or wearing keys can be assumed to be a very wise, very powerful, or both wise and powerful character, for example, such as wizards, kings, wealthy or successful heads of family, etc. ), or in other non-verbal communication such as surrendering the keys to the city to a conqueror or a beloved and respected dignitary. Of course, a key is just a symbol, and no more and no less capable of doing magical things than written or spoken words. However, symbols are anything but as simple as being “nothing more” than tools for opening locks, or dark scratches on paper or parchment, or weird sounds made by magical talking monkeys. Symbols, such as key-shaped jewelry, or spoken and written words, are rather a form of communication, and as a form of communication, they are, in a sense, “keys” to unlocking entire worlds of someone’s thoughts and ideas – anything but “simple” stuff, and hardly anything to be dismissed lightly by anyone who values the power of reasoning with other people! My mother gave me a set of skeleton keys which were given to her by her father. Her parents used the keys to help make decisions about planting, buying, or selling merchandise. My mom watched as a young girl as her parents used these keys. She said they always worked. Should I be scared of these keys? Should I learn how to use them? I am very interested in them and where each one came from. “ ” When you think about its larger place in history, it was just another time the police harassed us.